Lost a password to an MS Excel workbook? Lost passwords for modifying sheets in an MS Excel workbook? Accent EXCEL Password Recovery will break the passwords and allow you to access your documents again! Supports MS Excel 2/4/5/6/95/97/2000/2003/2007/2010/2013. Passwords to workbook sheets are found almost instantly. They may differ from the original passwords, but they will be valid. To reduce the time of searching for a password to a workbook, the program has three search methods: a brute-force attack, an attack by an enhanced mask, and an enhanced dictionary-based attack. The enhanced mask allows you to specify the range of possible values individually for each position in the password that will be generated. The enhanced dictionary-based attack allows you to search several dictionaries and transform passwords read from them. The program will automatically change the case of letters, skip characters, interchange adjacent characters and cover most possible mistakes in a password. Many additional features implemented in the program will allow you to reduce the time required for studying the program, specifying its options and getting down to breaking passwords. For those users who use not only Latin letters in their passwords, Accent EXCEL Password Recovery makes it possible to select or create your own alphabet that will be used for generating passwords. The built-in Task Creation Wizard will guide an inexperienced user through all stages of creating the optimal password search settings step by step and give brief information about all options available in the program. The features of Accent EXCEL Password Recovery are now enhanced and it is easier still to work with the program. 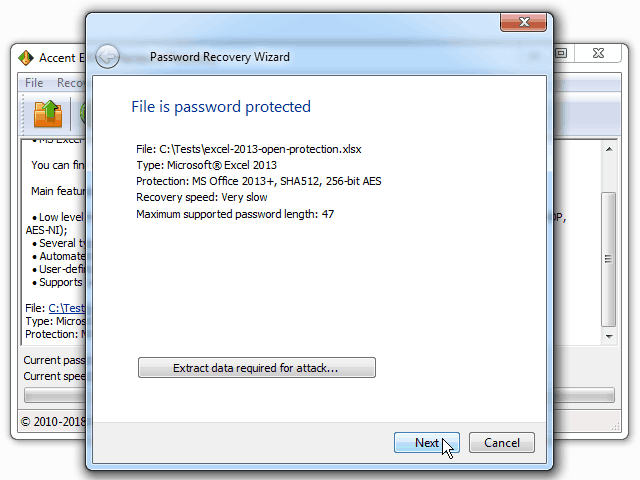 No need to be a pro to break forgotten passwords to MS Excel workbooks. See for yourself!